This home belongs to one of our member's Mother and this investigation was done after she had to be placed in an assisted living home. Prior to her going there, she had personally confronted me about her believing that the spirit of her husband was now in the home with her. 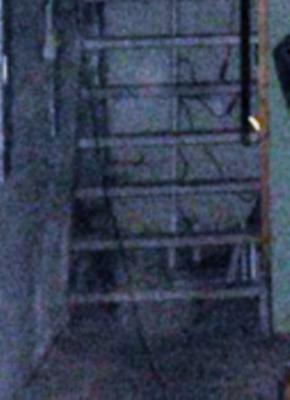 During this investigation, we caught several EVPs and this picture of what appears to be a woman watching us. We now believe from our evidence that at least 3-4 spirits are actually in the home and one of those spirits is indeed her husband (voice caught on recorder) and the spirit of his Mother (her voice caught on recorder, too), the spirit of Mom's sister (who may be the spirit in this picture) and possibly the spirit of Dad's brother, Charles (who smokes a strong smelling pipe in the living room area). I don't see the ghost. Congratulations on finding that and all the other evidence. That figure is clearly visible. If you look real close between the 5th and 6th step, you will see her face looking out. Once you see that, slowly move down with your eyes and you will see the rest of her body still in white type mist state. Her face had started forming but her body hadn't fully formed yet when I accidentally captured this. I'm sorry but I can't see it either. I think this is the best photo I have seen yet! I am an amateur ghost hunter and so is my husband...we keep in daily contact with a professional paranormal investigating team here in the area that investigates a lot of the Midwest in and out of state and hope to become part of their group one day soon. Again I can't tell you exactly how amazing that picture is! I cant wait to check out your site! The group that captured the apparition told about in the story, "Family Spirits Within a Home" is the Columbus Ghost Trackers (of Indiana). We now perform our "training investigations" for upcoming new members within this same home and hope to capture more evidence of paranormal existence there. Thank you Deborah for your information. Did you get anything on video? If you put the EVP or video through YouTube, send me the link. I'll put it on this page.